Aaahh . . . lakeshore golf. If you are on vacation in the summer around Lake Michigan your mind will eventually wander to golf (Ok, so mine does . . . maybe yours does too). So let's see should we go Arthur Hills or Arnold Palmer? Both of these famous designers have put creations right in the middle of our Beach Towns area. And both of them are excellent!!! Any conversation about the best places for lakeshore golf near our four Lake Michigan Beach Towns has to start right in South Haven with Hawkshead. This is an Arthur Hills creation which makes great use of the natural dunes and grasses that you find near Lake Michigan. 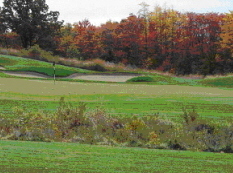 The course is just minutes from downtown South Haven and is in links style. There is excellent dining and an Inn in the shape of an old Tudor Mansion also onsite. This course is great on all fronts . . . and backs. But 15 minutes away in Saugatuck is one of Arnold Palmer's creations, The Ravines Golf Club. Remember how we told you that a trip to Saugatuck had to include the Arts? Well, their golf course is the same. Each hole is a unique piece of nature's best art. You will quickly see why it is called the Ravines and it will definitely fill up your appetite for excellent golf. There are really lakeshore golf courses everywhere you look around our Beach Towns. This is Michigan after all, home to more golf courses per capita than any other state in the union. You will find excellent new courses and old standbys in South Haven, Saugatuck, Holland, and Grand Haven. And you don’t have to limit yourself to this area, there are championship courses nearby that are well worth 45 minutes in a car to get to. We will be adding as many as possible to this page, so please check out our sponsors below. And let us know if you find a favorite we should add.